All Raz Colt wants is land, a quiet, peaceable existence, and to put his life as a hired gun in the past. When the chance to earn a sizable fortune by rescuing a kidnapped heiress comes his way, he seizes the opportunity. Trouble is, the heiress doesn't want to be rescued. Offsetting Arden O'Hara's beauty is a rattlesnake personality and shrewish temper. Despite her claim that she faked the kidnapping so her fiancé would ride to her rescue, Raz knows someone is out to kill her. And if anyone gets the pleasure of wringing her lovely neck, it's going to be him. Arden O'Hara is desperate to go home. Her fiancé was supposed to ride to her rescue, proving it's her - and not her father's money - he loves. Instead, an arrogant stranger with weapons strapped gunfighter low and a decided lack of sympathy for her situation shows up spouting a ridiculous tale about someone trying to kill her. It's infuriating when Raz Colt's claims prove true after not one but several attempts are made on her life. She has no idea who this fast gun with the deadly aim is or why he makes her feel as wild and untamed as the Texas wind. But like it or not, if anyone is capable of getting her home alive, it's Raz Colt. Loved the mystery, romance, and adventure so carefully woven together. I for one wouldn't mind meeting Colt and being rescued by him!! 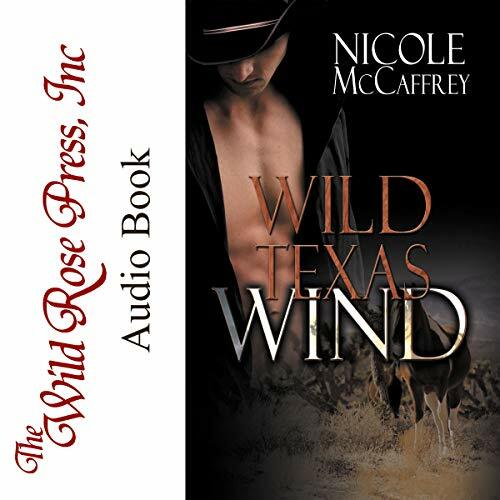 Wild Texas Wind by Nicole McCaffrey is a great western romance by one of my favorite authors. The hero was strong and commanding throughout the entire story. Loved the other characters and the plot. It is narrated by my favorite narrator of romance, Dawson McBride. He does an excellent job of bringing Ms. McCaffrey's historical western to life. This novel was well written and it was done so well. The narration was on point and really helped weave the story together. It is a sign of a great novelist when I hate the heroine and then at the end of the novel I actually liked her. The narrator did a great job with both the male and female characters which I'm a stickler on no matter what novel I read. I highly suggest this novel to anyone who is looking for a good western romance to listen to on the commute! She's was kidnapped. He's to bring her home. Emotional, Funny, Opposites attract, Will her love bring him back? Loved the narrator. Can't wait to listen to another book by Dawson McBride. You can feel the tension between the characters. Friends and soon to be family are your worst enemy. Arden, a 21-year-old woman who is used to getting her way in all things, spoiled by her family who lost his wife he allowed his daughter to pretty much rule over everyone. Even though her father did not approve of the man she was going to marry, he gave her his blessings because that she what she wanted. But Arden decided to fake a kidnapping to see if her husband to be would come and rescue her, however, it did not work out that way. Instead, she was actually kidnapped unbeknown to her. Colt, a half breed was hired by hArden's father to rescue her, the payment for the job was enough for Colt to give up his job as a hired gunman and settle down which is why he took the job. But things do not work out as he planned when he finally meets up with Arden. The two are instantly attracted to each other but denies it to the end. The story is well written and you are guaranteed tons of twist and turns, a laugh, sigh and cheering the characters with throughout the story. I have found myself a new Western Romance author and will certainly continue reading her novels. Arden is kidnapped and Get father hired Raz to find her and bring her home. I'm not sure if she is the wild Texas Wind or if its Raz. But they are like oil and water but can't seem to stop the chemistry between them. I love this narrator. I've listened to other books he has narrated and this one rated up there with the others. His voice is great for a wild western. This was also the first book I've gotten by Nicole McCaffrey. This is a great story that is well written and narrated by the talented Dawson McBride. It is the story of two people that are not made for each other. Arden is a spoiled, rich young lady who while growing up didn't receive proper discipline. Raz is a gun-fighter/bounty hunter who was raised in a bordello. Yes, opposites attracts. The story had me laughing as these two try to get the upper hand. There was also some surprising twists and turns as well. And it does have a happy ending. I highly recommend this book knowing whoever reads or listens to it will be happy that they did. If you love reads with real heroes and strong women, then this story is for you. McCaffery takes us back to the old west, to a rougher time when a man had to fight to stay alive and fight harder to protect the woman of his heart. A must read!!! Looking forward to more from this author!